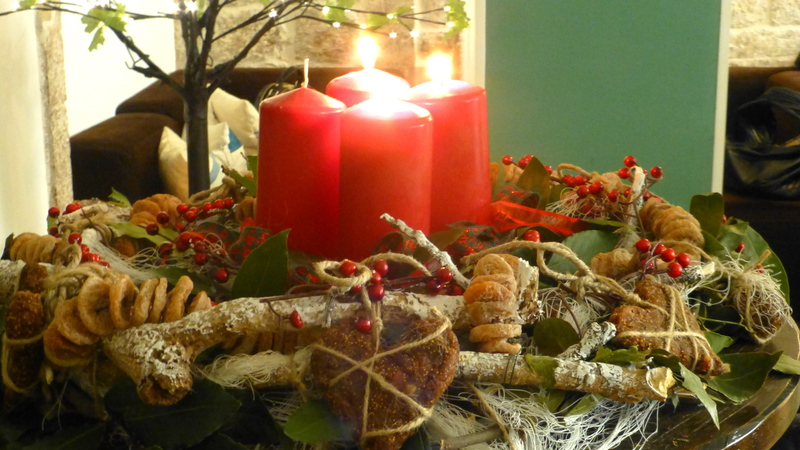 The month before Christmas is so magical…Christmas lights, churches filled with young and old, Christmas concerts, traditional Christmas treats, food and mulled wine. 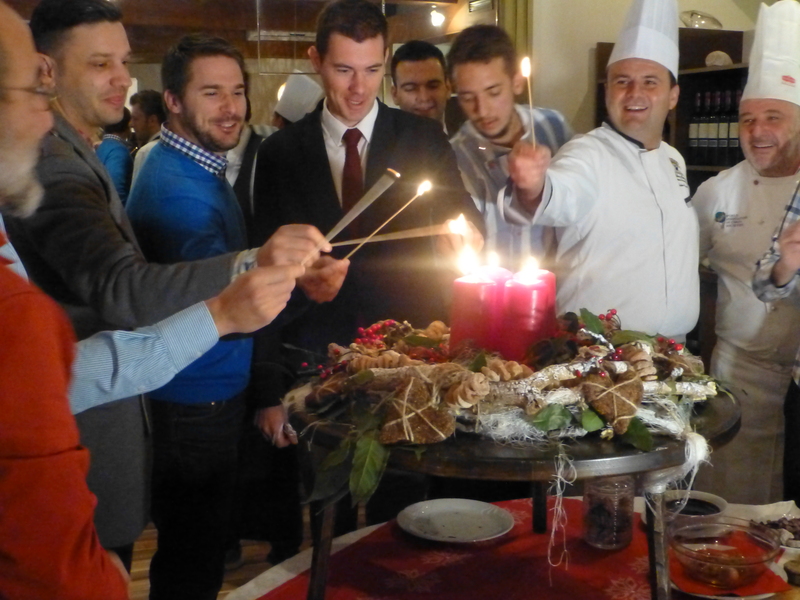 We were fortunate to be invited to the lighting of the four Advent candles, held on each Sunday before Christmas…and amid much ceremony and authentic Christmas fare, all prepared by some of our leading Dalmatian chefs for our total enjoyment. The four candles were beautifully centered, surrounded by Dalmatian figs, bay leaves, red Christmas berries and natural adornments…designed by Olja Martincic . Christmas shopping is always a pleasure here in Split at this time of year with so many handcrafts and homemade delicacies to choose from…No need for highly expensive gifts. I prefer to wander through the Christmas markets of the local artisans, where one can find a never-ending collection of exquisite handmade crafts. In the evenings we wrap up well, warm coats , scarves, boots, caps and gloves! I love the winter wardrobe…and Split is well known for fine fashion, latest shoe trends and designer sunglasses…although I still love my little Dior sunglasses from way back…2002 I think! 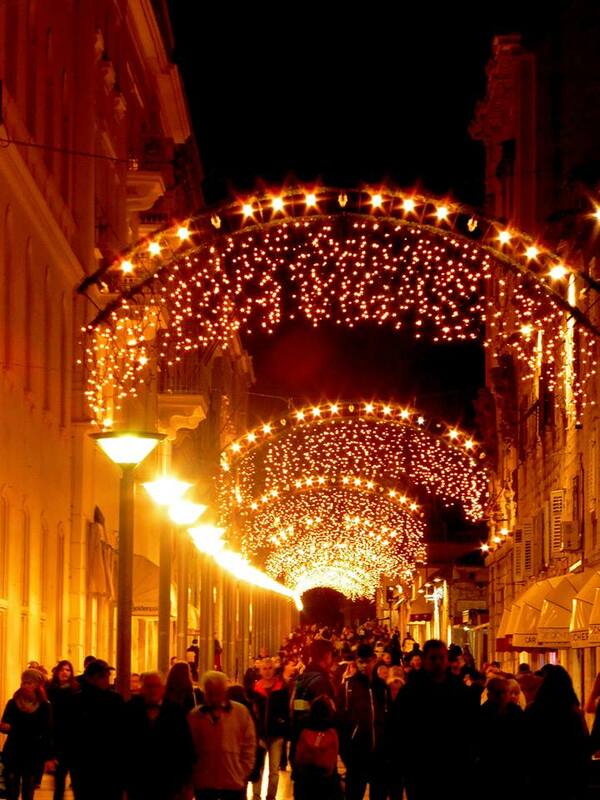 Christmas shopping at night is truly delightful…and the festive lights are so magical…turning the city into a winter wonderland…..
At home we decorate in similiar style with Advent candles burning, and wheat seeds are sown…sprouting to signify the new life of baby Jesus Christ. The seeds are placed in decorative ceramic bowls, decorating tables or window-sills. 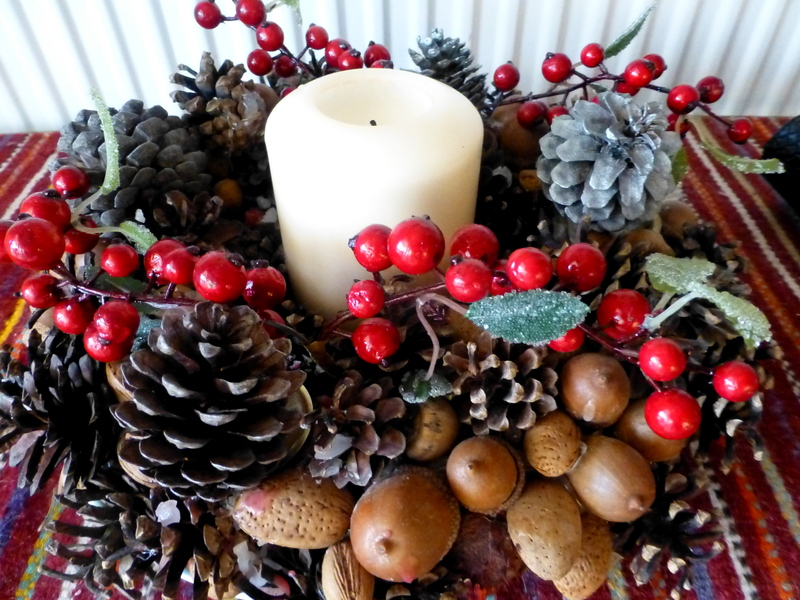 My Christmas decoration was made by hand…..we collected the pine cones, painting them silver and the nuts and acorns were nice and natural additions…simple yet full of Christmas warmth. Finally it is Christmas Eve, a day and evening to prepare the ‘bakalar’ (dried salted cod )that has been soaked in water over the previous day, then cooked in various ways according to preference, followed by freshly made ‘fritule’ (small spoonfuls of doughnut batter, dropped into hot oil and fried to golden perfection. 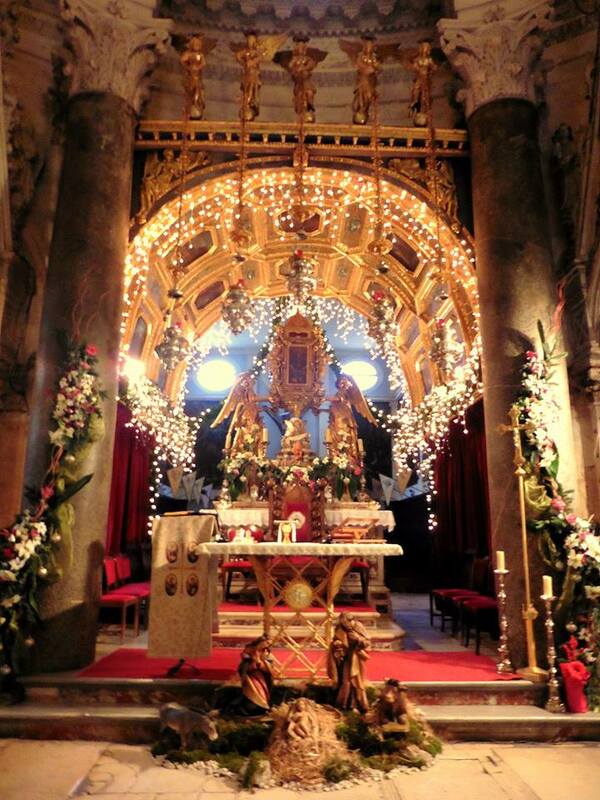 The churches are filled to capacity…Tonight we make sure we are a little earlier than usual to avoid the crowds of worshippers at the cathedral of St Dominus, on Peristil, the heart and soul of ancient Split. 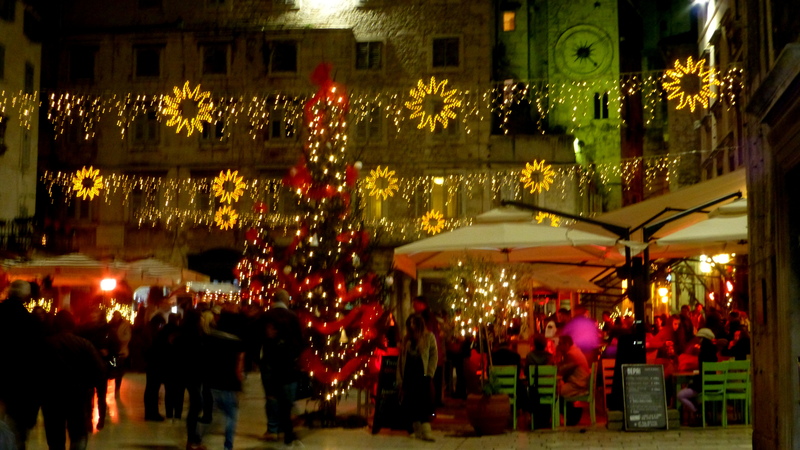 Ahhh …..The entire month of Christmas Advent is definitely one of my most favourite times of year in Split. I feel very blessed and fortunate to have been given the opportunity to be part of this city; it’s tradition, people, wonderful locally produced and prepared foods and wines, and sharing time with so many good friends. Thank you SPLIT!